Microsoft Excel is one of the programs mostly used as it helps to organized data and information. It’s flexible and handy to those who want to learn about its functions and keep you well thought-out. For the initiating user of this function, you have to research first its use on how, where and why you should utilize this on your spreadsheet. However, the user must learn and understand the meaning of this function before this article discusses the main course. AutoFilter is the filtering of data that are to be ignored. Auto filter can properly manage the worksheet. With the Auto filter feature, it is significant to know and learn the retrieval of hidden data. Once the user enable to know the different command function of the programs, it is now easy for the user to use this software program. The mostly used among the Excel functions is the Auto filter in spite of the fact that Excel software program has many available functions and commands. It also aims to hide certain data that are now waste and unusable. Data filtering is the way to hide certain data or records focusing to other data. This is done when the user is working with multiple data. 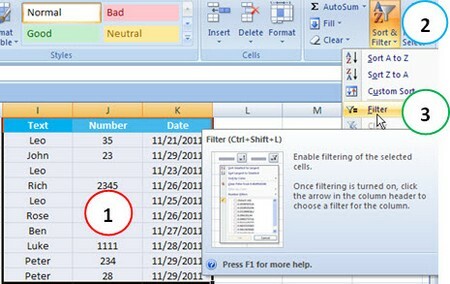 Microsoft Excel offers two approaches to filter records or data – Advanced filter and the Auto Filter. Both are required to arrange list data from different variables in various columns, different records in various rows and first row variable names of every column. This requires the user to arrange information in its list type. The main objective of Auto Filter feature is to let user to easily concentrate on the separation of records within their list. Microsoft Excel Auto filter will ask you to treat it as a name for the first rows thus it is called Column names. Therefore, alphabet letters written on the top of the spreadsheet columns called as variable names. AuotFilter done in two methods the first one is through dropdowns and the other one is through other criteria. The dropdown method is the easy one. This method will only hide the rows that do not meet the criteria for filtering that was set through the dropdowns. The other one is through using the other criteria. This is identified as the Custom AutoFilter. This usually supports the wildcards. Some of the symbols are used to represent certain characters. For instance, asterisks are used to represent series of characters and question mark corresponds to a single character. This is best to use during difficult times, wherein data are too intricate to handle. Since, Auto filter is designed to temporarily hide data, there are situation where in the data hidden are useful to complete certain information. Therefore, in order to the base a chart off Auto filtered records, it is very important to remove the Auto filter. It could perform once or individually, depending on the needed record. There are two ways to found data that Autofilter are being Filtered. With the two methods, it is better to know first the fast method. In this method, the AutoFilter Dropdowns are the most important key for the easy charting off. First, click the desired data. After hitting “Filter”, click the check figure in the “Auto filter”. Click the arrow in the column. Automatically after clicking, the entire data on the column that are AutoFiltered will automatically noticeable again. This two-way procedure will take you away from the individual clicking of the column and then it helps you organize your time not to be wasted. These two-way procedures are done mostly by Excel users to view back the original data that are Auto Filtered. Microsoft Excel Autofilter is easy to use and once you are familiar with this feature, all your multiple task using Excel spreadsheet will automatically be done in no time. Thus, this will result to the proper management of your data. Moreover, you don’t need multiple spreadsheets just to monitor all your previous and future data.